Everybody knows that fashion has a tendency to come back after some time, so antique and vintage styles and separate furniture pieces are never completely forgotten. Cast iron garden furniture is one of those most simple antique units that can add some style and create an exquisite looking décor by itself. Being durable, comfortable and in vogue at the same time, this furniture is the perfect choice for your patio or garden. There are things that never go out of fashion, and one of them is vintage looking or antique furniture. Cast iron garden furniture has gained its popularity over the years thanks to its functionality, convenience and durability. But that is not all. This kind of outdoor furniture can instantly turn a bleak garden into an antique and fashionable oasis. The greatest thing about is that it doesn’t need any additional decorations to create a finished look, so you won’t need to worry about the smaller decoration or basically any other pieces except a table and some kind of dining chairs to make it all work. At times, we may have a desire to dine outdoors in the warm summer weather under the shining sunbeams. Still, it might become a real struggle, as ordinary plastic garden tables tend not to be as comfortable as modern indoor dining tables . All the issues that you might have with plastic furniture are completely eliminated in the cast iron pieces. Unlike light and cheap plastic solutions, cast iron units are durable and steady, while being stylish and beautiful. So, if you ever had problems with your plastic garden furniture, you might as well consider going for cast iron alternatives. The first thing that you may notice is that cast iron furniture for patio or garden is more pricey that many other alternatives. Basically, it is due to the higher quality of the materials that ensure its long service period and will allow you to use it for years and decades without it losing its attractive look. Anyway, while antique cast iron garden furniture hunters are ready to pay a fortune for an original piece, you have no need to spend so much, having a possibility to purchase new garden furniture set for a moderate sum of money. 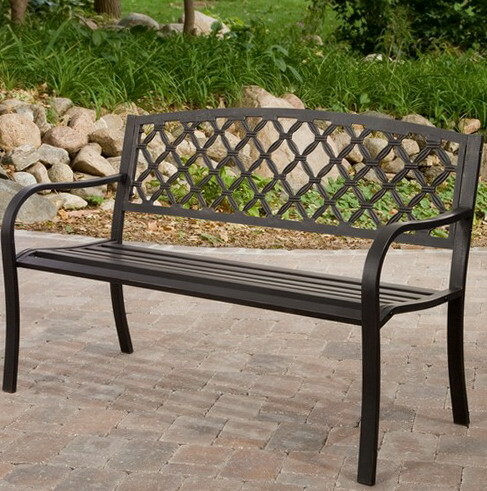 Besides, you may often find a cast iron garden furniture sale, where you can find the same pieces for lower price. Check out big furniture stores like Furniture in Fashion that regularly run sales and clearances – chances are you will find something truly special for a discount price. If you think that the cast iron outdoor furniture comes exclusively in antique and vintage décor, you are deeply mistaken. Thanks to the modern variety of decoration styles, cast iron garden furniture is now created with contemporary looks alongside the classic ones. Thus, everyone can profit from the durability and convenience of cast iron models without giving up their style preferences. Still, if you need more tips on shopping for garden and patio furniture, check out this guide .